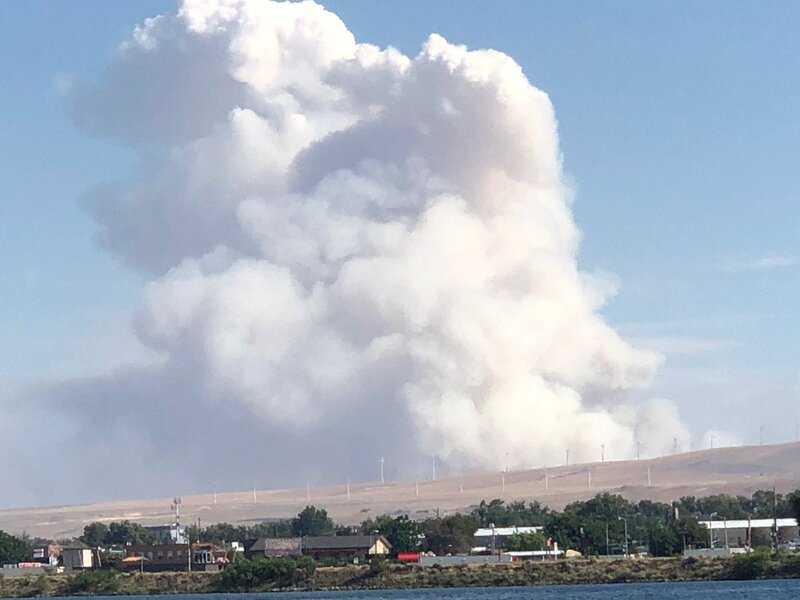 KENNEWICK, Wash. – Benton County Fire District #1 fire crews responded to a brush fire near Easterday Farms, just south of Kennewick in Nine Canyon Road on Friday, June 22nd around 1007 hours. Containment became a factor when the eastern Washington winds and dried out fire fuels mixed with the wildfire were picked up spreading to the east end. This prompted an immediate for more resources to respond on to the fire line. 1007 hours | Benton County Fire District #1 firefighters respond and battle a brush fire that was at 25 hours but with the winds, it would spread. 2 Strike teams are ordered. 1009 hours | Fire is burning along Nine Canyon Road. 1044 hours | The fire has increased rapidly and is now at 200 acres with a 20% containment status. It is located in the Switzler Canyon which cannot be directly accessed due to poor terrain for ground fire crews. A dozer line is put in. No structures are threatened and there are no injuries reported. Local mutual aid units Benton County Fire Districts #2, #4 and Franklin 3, KFD, PFD and RFD join forces to fight this stubborn wildfire. 1330 hours | Fire crews are beginning to get a handle on the fire with a new containment status of 30%. The fire is almost completely surrounded by a dozer line in prepping crews to start conducting burnout operations. After all that is complete, Fire Officials estimate the fire should be at 350 acres. They are working against the weather clock which includes windy conditions. No structures or agriculture are being threatened. 1601 hours | The wildfire jumped the dozer line and could not hold it to a full containment status. More resources are ordered. 1641 hours | Resources were dispatched through the Central Washington Interagency Communications Center to the fire. 1723 hours | Fire is burning 17 miles south of Kennewick near S Findley Road in Nine Canyon. 1757 hours | Washington State Fire Mobilization has been approved the Washington State Patrol (Fire Manager). Air resources have arrived. Several reports of minor burns and smoke inhalation injuries but none were critical for ALS or BLS transports. Some structures were threatened temporarily but structure protection was put into place. These are no longer under threat. 2257 hours | Forward rate of spread has been stopped and in mop up operations. Fire Officials estimate the size of the fire to 1,000 acres. 7 engines will remain on the fire line tonight with an additional Strike Team arriving on Saturday, June 23, 2018 for day fire operations. 0930 hours | 95% containment. Night crew did an overall great job. More accurate mapping puts the total acreage destroyed at 700 acres. Strike team of engines mopping up during the day and objective is to have complete containment by 1600 hours. 1751 hours | 100% containment achieved. All engines in the process of being released. More accurate mapping completed putting the final total at 1,299 acres.